Are You Ready to Get Your Lean On? I hope everybody is having a wonderful spring thus far! I am enjoying the changing of the seasons for sure! I wanted to mention a couple of things this month. One is the method I just used to shed 10 pounds. And two is an exciting new project I am working on! Let’s start with my weight loss. About 2-3 years ago I went on the Whole30 eating plan and really trimmed some body fat and felt great! Well, fast forward about 3 years and I recently found myself in a similar situation where I wanted to trim down some body fat and get my lean on for the summer. This is a radical plan. I talked about it in my newsletter the first time I did it, and I can’t help myself, I have to talk about it again now. So here are the very simplified rules of the Whole30 plan. You have to cut out all alcohol, processed foods, legumes, dairy, grain, and sugar. What this leaves is whole food, hence the name. Fruits, veggies, healthy meats, seafood, nuts, seeds, and healthy fats like coconut milk, coconut oil, olive oil and avocado. You can go to Whole30.com for the whole spiel, but suffice it to say that it is pretty strict. The idea is that you completely kick the specific aforementioned things out of your diet for a full 30 days. No cheating. If you cheat you have to start over. They want you to see how awesome you feel if you get these things out of your system for that amount of time. Another rule is they don’t want you to weigh during the 30 days. Just get a start weight and a finish weight at the end of the 30 days because Whole30 is about health, not-so-much about weight loss. The weight loss just happens to be a by-product of eating so cleanly. I lost a little over 10 pounds. I feel awesome! Better than I have in years. And I ate 3 great meals every day. I ate a lot. 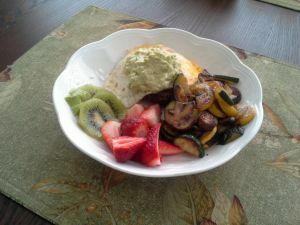 The pic below is a typical whole30 breakfast. There is an organic angus beef patty under that egg. It was delish and very filling!!! All the meals are like that! Everything I ate was all healthy and Whole30 compliant. I went on this with a friend who also lost 10 pounds. Two things you have to do in order to be successful. Plan and cook ahead. We cooked a bunch of stuff on Sundays to get us through most of the week. And secondly, you have to learn to be an expert label reader. Because food companies are sneaky. They sneak sugar in just about everything and give it code names. So you will be paying close attention to the ingredients. But don’t worry, the website at whole-30 gives you everything you need to succeed. After the 30 days, which mine ended today, they want you to slowly add things back in that you have been avoiding if you wish to do so. That is one thing at a time every few days so that you can see how that particular food affects you. There are many foods that I intend on continuing to avoid most of the time. I, personally, have decided to graduate into a Paleo plan for 80% - 90% of the time. Whole30 is like Paleo turbo charged. But that is a subject for another newsletter. In summary: I love Whole30. You should try it, but do your homework. Go to their website and read their book "It Starts With Food." It will definitely get you fired up for the 30 days. And you will need to be fired up in order to pull it off. But it is so worth it! I feel great and so will you! Now, about my exciting new project. I am building another website. Woohoo! Yup! It’s true. This one is dedicated to Women over 50. You can check it out at fitnessforwomenover50.com. It is new so be patient as I add content. I will be blogging at least 1-2 times a week there as well as adding content pages. So, if you are a lady over 50 or know one, spread the word! Head on over! I plan to share much need-to-know info for all my over-50 peeps! Drop me a comment or contact me and say hello! If there is anything you want to know about or have concerns about, please don’t hesitate to ask. I am always looking for good content ideas! Okay, that is it for this month. I hope you guys have a great spring, and I will talk to you again next month. Until then, may the wind be at your back and improved health and vitality your new reality! This month's featured exercise is a fun way to do cable curls at the gym. These are lying cable curls. Not that they are untruthful, but they are done in a horizontal position instead of vertical (standing). Try them for an intense biceps burn. Good stuff! Tips: 1) Keep wrists straight throughout. 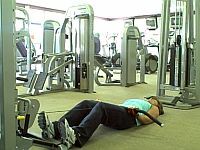 2) Keep upper arms barely in contact with floor throughout the exercise. 3) Keep a slight bend in the knees.